His work is based in fact and proven by science ~ it’s all about heart connection. He is one of many such horses at the facility where I am learning to be a facilitator of equine experiential learning. Of course, as I learn how to facilitate, I experience the process ~ the incredible power of the horse to reflect back to us who we are in our truth. Their ability to move us through a stuck state and give us the proverbial wings to fly. As I learn I experience a positive shift in myself. My own view of Self becomes clearer. I am empowered to heal my inner life through the wisdom of the horse. So, I would say to you that yes, horses make that landscape out there look more beautiful, and thank goodness for that or it might make for one boring drive in the country. Still, I can’t help but believe that the changes horses can effect on our inner landscapes given the chance, are equally, if not more, beautiful … and magnificently life affirming. 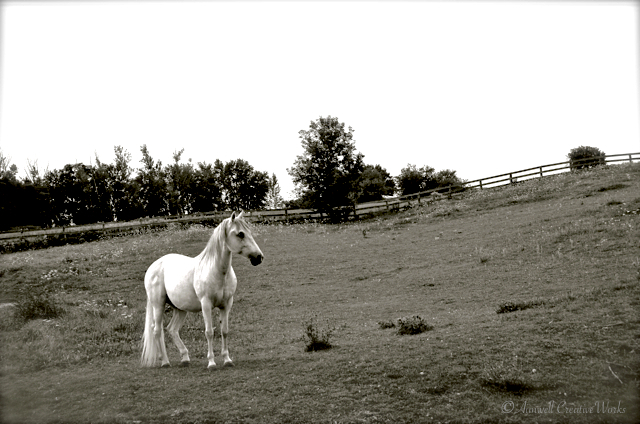 This entry was posted in Animals, Equestrian, Landscapes, Personal Growth, Photography, Uncategorized and tagged Aimwell CreativeWorks, black and white, Dorothy Chiotti, Equestrian, Equine image, Experiential Learning, healing, Horses, Light and shadow, monochrome, Photography, therapy horse. Bookmark the permalink. Wonderfully said, and I have no doubt it is true. What a terrific journey you are on!